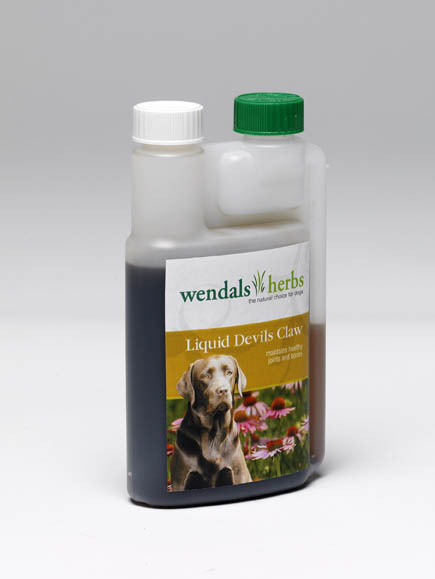 Wendals Liquid Dog Devils Claw Root is a liquid joint supplement containing the native African plant Devils Claw, a plant which has been successful in promoting joint health and mobility whilst continuing to be delicious. The powerful liquid offers lasting joint support to encourage flexibility and achieve optimal mobility. Water, Ethyl Alcohol, Extract of Devil's Claw. 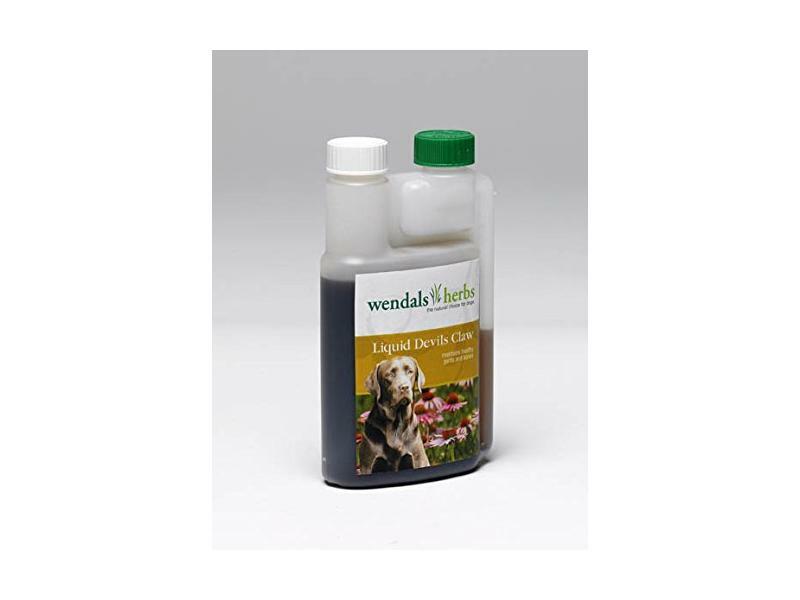 Below are some recent questions we've received regarding Wendals Devils Claw Root Liquid for Dogs, including answers from our team. Is the liquid for dogs the same strength as the horse liquid? Is the liquid only available in 250mls? Is the half litre horse mix the same strength? Yes, it's only available in 250ml. Our suppliers have said that it's the same product, same strength. The horse version obviously doesn't have the dog feeding instructions/dosage on it however, so just keep that in mind. You need to give the dosage applicable for a dog, not a horse! My 13 year old Labrador has arthritis in her back legs and spine. She has been on Previcox for about a year now and at first they seemed to work but now, the effectiveness seems to have subsided. I guess her system has built up a resistance to them now. I am really not keen on giving her drugs as know they have side effects. Her back legs are really quite bad now and they quite often collapse when she walks and she has difficulty in getting out of her basket first thing in the morning. My partner has to help her out. I have heard about Devil's Claw and wonder if this would be an option for her and whether it would increase her mobility and give her a better quality of life? Also, is it compatible with Green Lipped Muscle, which I have heard is also good for joint problems? Devil's Claw and Green Lipped Muscle sound like appropriate supplements to give your dog and they might well help. They are often used in situations like this and are relatively free of side effects too, so I think you could try them. (Some people suspect that combining Devil's Claw with an NSAID drug such as Previcox might lead to side effects from the NSAID, but I doubt that this really happens. You might want to stop the Previcox just in case while trying Devil's Claw.) Having said that, Previcox should have a much more potent effect than either of the supplements. If it is failing to help now, it might be for lots of reasons, but building up a resistance is not really one of them. The underlying problem (s) may simply have got worse. In any case, if a medication is not working, it is best not given. You should be careful about this though. The most likely side effect I can see might well be a whole lot more pain as a result of stopping the Previcox. I would suggest assessing carefully how your dog seems to be as a result of any change you make. If you stop Previcox, it would be best to discuss this with your own vet too. Previcox is one of the best prescription treatments for painful, inflammatory conditions in dogs. I have a 15year old yorkie who is on steroids permanently, he also has synoquin, is devils claw ok for him to take. There is not enough evidence to be sure about this. Some people feel that there is enough of an anti-inflammatory effect in Devil's Claw for it to combine badly with steroids, giving the chance of serious side-effects. However others doubt that this is at all likely and the concerns are based on a misunderstanding. I am sure that some people do use them both together and personally I expect this should be fine. If you try it, I would suggest a low dose of Devil's Claw at first, building up gradually to the normal recommended dose.